Did you Know that Norman Rockwell Intentionally Changed his Signature for each Piece of Art? Norman Rockwell was profound in his depiction of daily life–idyllic or struggling or controversial. And given this range of topics, he thought it was appropriate to change his signature based on the mood of each painting. “The commonplaces of America are to me the richest subjects of all.” He chose moments with people, my travels take me to spaces. But I agree with him, it’s why I love traveling this country. There’s so much that is simultaneously breath-taking and breath-giving. 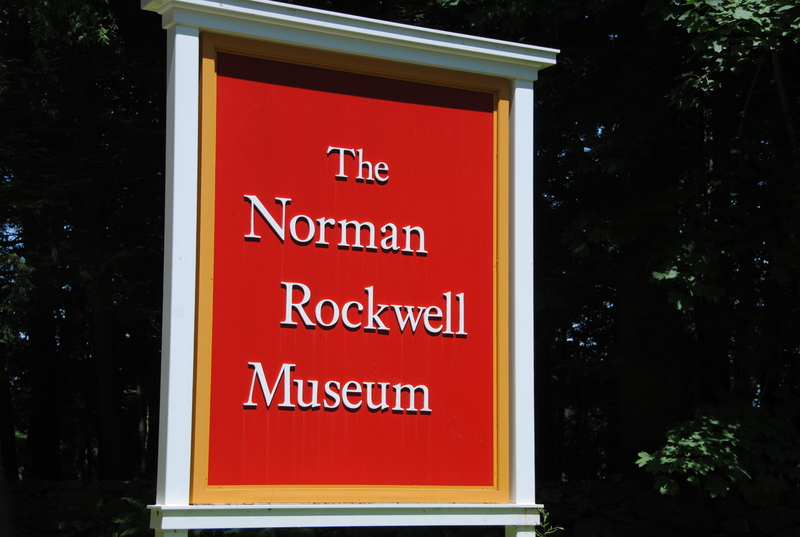 The Norman Rockwell Museum is in Stockbridge, Massachusetts, in the Berkshires. The exhibit itself is surprisingly limited – so many pieces on loan to other museums. But here you get a deeper education about his process: posing neighborhood folks for pictures and then painting proper oil on canvas from the shots. Those were then taken to the magazines for publication – actual canvas. I think of the juxtaposition of modern photography instead of sketches, yet canvas was still needed, or preferred, for the final product. 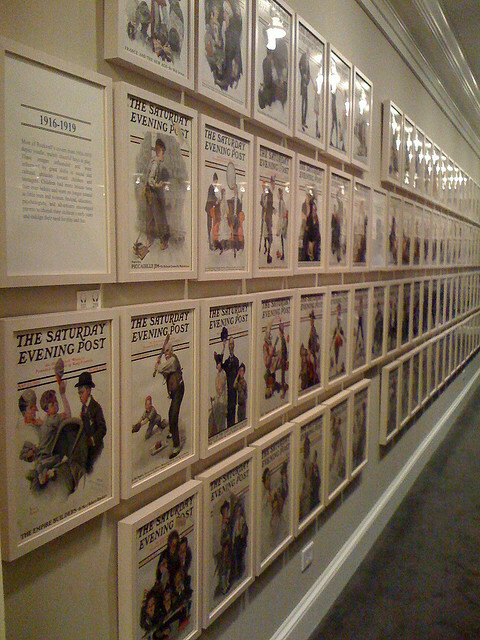 And then there’s the room with all 323 Saturday Evening Post covers. It’s a sight to behold – a life’s work displayed row upon row. His first cover was published at age 22 and his last 47 years later. Travel was a common theme: off to the watering hole, the honeymoon or to war. He depicted the adventure, weariness, wariness. Sure, I’ve seen his work before, even been to the traveling exhibit with the large canvases from the Saturday Evening Post. I wasn’t prepared for how connected I would feel to his work, for how touching I would find it. For how the details would catch my eye and give me respect for an era and for a man. He truly painted with heart, loved the stories he told, and believed strongly in the messages he had opportunity to convey. I’m not an art historian to assess his talent against Michelangelo. But to me that’s a merit-less debate: they had different roles in the world. Who do you consider to be an expression of the changes in America – past of present? These are a few the pieces that particularly caught my eye. Can’t see the slideshow? Click here. We visited this museum just last month, but I didn’t learn that interesting fact! Too busy trying to keep my 4-yr old entertained! Luckily, the Curious George exhibit had just opened. My favorite spot in this museum was the theater downstairs with the gallery of Saturday Evening Post covers. So impressive, especially when displayed together!